MONKEYS ARE MY FRIEND: Celebrate! With the new test results Dr W has changed his mind; he no longer thinks I have a second autoimmune disease! Yay! He now thinks that I had a really bad case of celiac with lots of inflammation that was throwing everything totally out of whack. I still go see Dr B next week but Dr W said he really anticipates that Dr B doctor will say the same thing after seeing my tests. This is exactly what I was hoping he would say! Of course, I suppose I need to wait for Dr B to make it official next week but I'm still pretty darn pleased. I have a follow up appointment in three months just to check on things and right before that appointment they are going to re-do my blood work again and give me a bone density test. (Dr W says he's interested in redoing my TTG test (the test they use to see if you have celiac) then, too. Anything over four is considered positive. When I was tested I was at >100. He's curious to see how quickly it will drop now that I'm gluten-free.) But until then, my directions are to just stay on my super strict diet and enjoy feeling better. Yay! 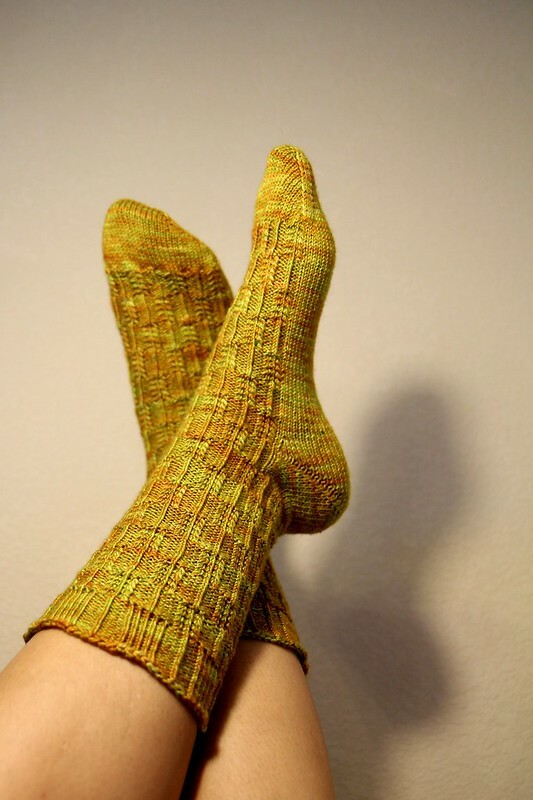 And in more happy-fun news on the celiac front, I have finished another pair of socks. I shall call them my wheat feet socks. The yarn color is called golden wheat and the stitch pattern is repeating wheat stalks. Yes, both choices were intentional. They are my farewell to gluten socks. Call it a bit of catharsis. They are ridiculous and I adore them.